We’re Celebrating 70 Years & Going Strong! Manufacturing production is expected to grow 3.4% in 2016 compared with growth of 2.1% in 2015, according to the MAPI Foundation, the research affiliate of the Manufacturers Alliance for Productivity and Innovation. Of course, a number of factors could affect those predictions, including world events and the long-expected Federal Reserve increase in interest rates. We can’t control these external events, but we’re confident that we can adapt to changing conditions as we have throughout our 70-year history. Rangers’ first castings were several toys, including replica of the Offenhauser Midget race car that remains today as the Rangers Die Casting logo. Since then we’ve evolved to produce precision, high-quality aluminum die castings for the automotive, aerospace, communications, computer, HVAC and other high tech industries. We operate in a geographical area that has maintained a solid base of die casting production compared with the significant shifts that have occurred in other parts of the country. For example, between 2006 and 2014, die casting production shrank from 48% to 37% in the Midwest and increased significantly in the Southeast, primarily as a result of more auto production in that area. On theWest Coast, die casting production has remained fairly steady, declining only 1% over the same period, according to the North American Die Casting Association (NADCA). This stability means that our customers can rely on experienced die casters who know the market and can anticipate customer needs. Part of anticipating customer needs is education about new methods and innovations that can help them improve production, reduce costs and create better components. Larger and stronger die cast components are increasingly replacing permanent mold components or stamped and assembled structures in the automotive industry. For example, a number of manufacturers are incorporating aluminum die casting for A, B and C pillars, suspension control arms, engine cradles and similar components. The next frontier is greater use of thin wall castings for door frames and SUV hatches. BMWhas created an inner panel for a back hatch that is cast as one piece and weighs 16 kilograms. It replaces a steel assembly that required the assembly of 10 parts and weighed nearly twice as much. Many innovations are driven by the automotive industry, which has the highest use of aluminum die cast parts, and is seeking more ways to incorporate lightweight die castings in order to meet increasing fuel efficiency standards. These improvements are also being applied to components for other transportation segments, such as trucks, motorcycles and snowmobiles, but they can be adapted for other industry segments. Aerospace also is a fertile ground for use of aluminum die castings. According to NADCA, inquiries about aircraft use account for almost 9% of the requests they receive. NADCA is currently participating in the “LIFT ThinWall Die Casting Project,” which is developing castings down to 2 millimeters thickness. Testing is currently underway with Boeing for thin wall aircraft components, including a wing fuel access door and a wing access cover. Other innovations that are not industry specific will expand the market in many ways. For instance, changing the composition of certain aluminum alloys with the addition of strontium improves tensile and elongation properties. Changes in fill rates and more selective use of die lubes improve productivity and reduce material costs. Another improvement is the use of 3D printed cores to provide better heat control, resulting in components that require less post-production machining. An industry project also is underway to enhance digital design capabilities for die casting. The goal is to integrate traditional simulation tools with data verification, validation and uncertainty quantification tools. This will enable designers to better determine the capability for creating a component as a die casting. To help you better understand these exciting opportunities for new die casting applications, we added industry veteran Paul L. Spencer to our staff. Paul is our Director of Business Development, and he will help you develop solutions and explore new ways to use die cast components. His expertise is based on more than 25 years of experience in the die casting, finishing, machining and plastic injection molding industries. We look forward to serving you in 2016, as we move into an exciting year for our company and our industry. For more information about how we can help you design and produce effective aluminum die cast components, please visit www.rangersdiecasting.com. We know from discussions with our customers that the three main factors in choosing a die caster are cost, quality and delivery. However, understanding how your supplier will perform on each of these elements usually requires digging deeper. Here are five hidden factors that OEMs often use when choosing a die caster. Having a track record in producing similar parts provides OEMs with confidence that you know what it takes to produce a casting. This shortens the learning curve and helps ensure quality and deliver are on the mark. We have delivered effective customer solutions for more than six decades. A corollary of solid experience is the die caster’s ability to communicate with customers to understand their needs and anticipate problems. 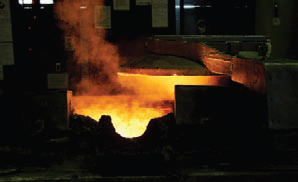 Effective analysis and recommendations may result in improvements on the original casting specifications, which could reduce costs or save production time. Long-term customer relationships are a good indication that the die caster is meeting expectations. OEMs also look at the breadth of the customer base. A large customer list usually means the die caster has experience in a variety of applications and components. Rangers works with customers in more than 25 industry segments. The ability to tailor production to the OEM’s needs can allow the buyer to use a die caster for a wider range of projects. Not having to review and vet a new supplier every time a new component is needed saves time and administrative complications. We deliver cost-effective solutions in quantities from 100 to one million pieces a year. Die casting is not like computer chip production, but the appearance and maintenance of equipment, storage of supplies and waste handling all provide indications of the overall operation of the company. Keeping these factors in mind will help guide the choice of a die caster that can be a long-term partner. During the workday, Ernie oversees maintenance matters and IT issues, including computer networking at Rangers Die Casting. At all other times, he’s busy focused on matters on the home front. In 2014, Ernie married his long-time sweetheart, Tracee, from Belize (where they are both from.) On November 2, 2015, he became a dad when Ernest Rogers, Jr. arrived healthy and happy just in time for the holiday season! An accomplished karaoke singer with an extensive selection of English and Spanish recordings, Ernie’s career at Rangers began in April 1997. He has always been a “take charge” person and loves what he does on the job. We expect he’ll be spending lots of family time with his wife and their young son. Ernie has served on the NADCA Los Angeles Chapter 30 Board for many years and presided as its chair from 2007-09. He received the Chapter’s distinguished service award in 2011. We wish Ernie continued success and much happiness for years to come. What AreYour Needs? We’re here to serve you with the finest in aluminum die casting. Let us know about your plans and challenges during 2016 so we can help.